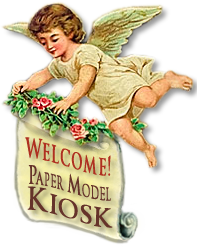 The Straw Roof Manger Nativity Sheet is a quality, two-page ink-jet print on 8.5 x 11 matte, heavyweight paper. Red dotted lines indicate scoring and folds. 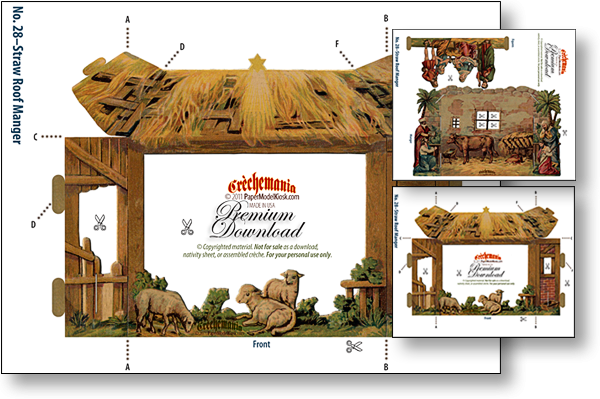 The two pages of the Straw Roof Manger Sheet will create amedium-size vintage German nativity, measuring 7.75 x 5 x 1.25 inches. The illustration at let shows the tabs of the Front that slip into the slots of the back to create your crèche (see photo, below left). On the image of the manger front, at left, red dotted lines indicate folds. You can see how the roof is folded three times, and the front twice to create the side walls. The front fits — what could be easier? — with tabls into slots cut into the back through the manger back. But not before the Figures piece — which features Mother and Child, Joseph, and two worshipping shepherds — is slotted into the side walls, as shown by the image below, left. This simple construction nevertheless creates a marvelous 3-Dimensional effect, as the roof slants back and wraps around the manger front. Palm trees, sheep, magi, and two more shepherds on the right complete the scene. You'll love working with the heavyweight, matte, professional quality Straw Roof Manger printed sheet. And you might wish to accent the manger windows with cellophane. Size: 7.75 x 5 x 1.25 inches. Buy Straw Roof Manger Sheet as part of a collection, and save!